Tyrphostin AG 879 potently inhibits HER2/ErbB2 with IC50 of 1 μM, 100- and 500-fold higher selective to ErbB2 than PDGFR and EGFR. Identification of tyrphostin AG879 as a Kv4.2 channel inhibitor. (A) Chemical structure of AG879. (B) Effect of AG879 on Kv4.2 channels in CHO-K1 cells. AG879 10 μM reduced the Kv4.2-mediated peak current by 31.27 ± 2.4%. The Kv4.2 channel currents were recorded by a depolarization to +40 mV for 300 ms from a holding potential −80 mV. (C) Inhibition by AG879 3, 10 and 20 μM of Kv4.2/KChIP2 co-expressed channels. (D) Concentration-dependent inhibition by AG879 of Kv4.2/KChIP2 channel shown by measuring peak and integral currents. Concentration–response curves for AG879 were fitted to the Hill equation. (E) Reversible inhibition of Kv4.2 by AG879. Maximal inhibition occurred ∼5 min after drug application. (F) Concentration-dependent inhibition by AG879 of Kv4.3 channels. Br J Pharmacol, 2015, 172(13):3370-82.. Tyrphostin AG 879 purchased from Selleck. Cells are grown in 96-well plates containing 100 μL medium per well. Ten microliters of MTT solution (5 mg/ml in PBS) is added to each well and incubation continued for 4 h at 37 °C. Subsequently, 100 μL 10% SDS in 0.01 M HCl is added. After incubation at 37°C overnight, absorption is measured at 550 nm in an ELISA reader using a reference filter of 690 nm. Administration: Intraperitoneally administrated on days 3, 5, 7, 10, 12, 14, and 17. Zhou Y, et al. Cancer Res, 2005, 65(13), 5848-5856. He H, et al. 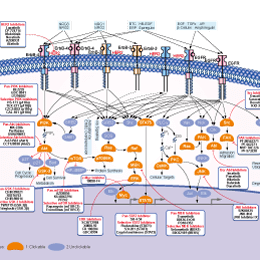 Cancer Biol Ther, 2004, 3(1), 96-101. Larsson LI, et al. Cell Mol Life Sci, 2004, 61(19-20), 2624-2631. Rende M, et al. 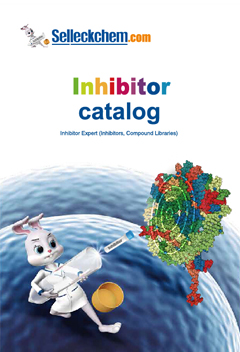 Anticancer Drugs, 2006, 17(8), 929-941. He H, et al. Cancer J, 2001, 7(3), 191-202. Levitzki A, et al. Science. 1995, 267(5205), 1782-1788. Lapatinib (GW-572016) Ditosylate is a potent EGFR and ErbB2 inhibitor with IC50 of 10.8 and 9.2 nM in cell-free assays, respectively. AC480 (BMS-599626) is a selective and efficacious inhibitor of HER1 and HER2 with IC50 of 20 nM and 30 nM, ~8-fold less potent to HER4, >100-fold to VEGFR2, c-Kit, Lck, MET etc. Phase 1. CP-724714 is a potent, selective inhibitor of HER2/ErbB2 with IC50 of 10 nM, >640-fold selectivity against EGFR, InsR, IRG-1R, PDGFR, VEGFR2, Abl, Src, c-Met etc in cell-free assays. Phase 2. Neratinib (HKI-272) is a highly selective HER2 and EGFR inhibitor with IC50 of 59 nM and 92 nM in cell-free assays; weakly inhibits KDR and Src, no significant inhibition to Akt, CDK1/2/4, IKK-2, MK-2, PDK1, c-Raf and c-Met. Phase 3. Sapitinib (AZD8931) is a reversible, ATP competitive inhibitor of EGFR, ErbB2 and ErbB3 with IC50 of 4 nM, 3 nM and 4 nM in cell-free assays, more potent than Gefitinib or Lapatinib against NSCLC cell, 100-fold more selective for the ErbB family than MNK1 and Flt. Phase 2. Mubritinib (TAK-165) is a potent inhibitor of HER2/ErbB2 with IC50 of 6 nM in BT-474 cell; no activity to EGFR, FGFR, PDGFR, JAK1, Src and Blk in BT-474 cell line. Phase 1. Gefitinib (ZD-1839) is an EGFR inhibitor for Tyr1173, Tyr992, Tyr1173 and Tyr992 in the NR6wtEGFR and NR6W cells with IC50 of 37 nM, 37nM, 26 nM and 57 nM, respectively. Features:A potent EGFR tyrosine kinase inhibitor.